Hiya!... It's JAI time again and this week we have a great sketch to work with......check this out! I enjoyed playing with this sketch and the DT have produced some really great cards to inspire you, hopefully you can play along and show us your interpretation. "Thanks for popping by & Have a great weekend"
Thought l would share a couple more cards l have made recently using the Bordering on Romance set. I have been so inspired by all the beautiful cards l have seen online lately using this set and couldn't help but case the second one. Inspiration for this card provided by LeeAnn Greff an absolute stunner. "Thanks again, your visits are always appreciated"
Morning...This week over at Just Add Ink we have another "Case a DT" challenge for you and this weeks DT member is the very talented "Jodene Tripp", Jodene's unique style is always an inspiration and scrolling through her blog a few weeks ago l found myself with a dilemma, it was narrowing it down to just one card to case....now that was a challenge in itself! I finally decided on this simple and elegant card, it's so pretty! I followed Jodene's layout and other elements, but as l didn't have DSP that was suitable, l decided to create my own using a technique shared with me by another talented DT member "Christine Blain"
The baby wipe & re-inker technique was a real "WOW" and this was the perfect opportunity to give it a go! Using the SAB set "Fresh Vintage" and Pool Party-Island Indigo & Early Espresso re-inkers this is what l came up with for a faux DSP, love the effect and can't wait to have a play with some other colour combos. The DT girls have cased Jodene beautifully and everyone chose very different cards to case, so pop over to JAI and check them out and hopefully we will see you in the challenge gallery this week. "Thanks for stopping by & enjoy a great weekend"
Back again with another couple of cards using "Bordering on Romance" & "Apothecary Art"
Both available in the current Autumn/Winter Mini, also in there are the lovely Edgelit Dies that l have used on this card, I'm really loving the detailed edges you can create with these. This first card was for a "Special" Birthday girl and she is a big fan of "Pinks & Soft Minty Greens" so l tried to use colours as close to these as l could, the green is some l had in my stash from forever ago and although the Pear seam binding looks a little bright in the pic, it wasn't nearly so IRL. The first card was coloured with Wonder Crayons again and the second with SU Markers, both with a blender pen. 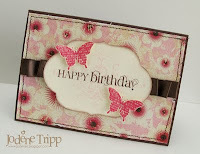 All supplies used are Stampin up (except the butterfly) & cardstock already mentioned. Hiya, thought l would pop in and share a couple of cards made with the new Stampin-Up set "Apothecary Art" and the new Framelits. This set is just so pretty...I'm in love! I kept them both cas, a style I'm really liking these days and l feel that these images are so detailed and pretty, they can definitely stand alone without too much fuss. I finally got around to digging out my "Watercolour Wonder crayons" for colouring them, applying the crayons direct to paper and blending them with my blender pen to soften them out a little.
" Thanks for taking the time to stop by & Have a great day"
This weeks challenge over at Just Add Ink is a gorgeous inspiration pic from Jodene. The DT have created some very inspiring cards for you, using so many different elements from this pic, my inspiration was the colours and the striped carpet, l combined those with some of the awesome techniques learnt during Tim Holtz "Creative Chemistry" on-line class l took recently....So much fun and l learnt so much and came away with an amazing increase in my product knowledge. I am hoping to substitute TH products with SU wherever possible, as l already have those. For this card l used Stampin-Up re-inkers and whisper white craft ink to create the background, l'm pretty happy with how it turned out and enjoyed getting inky and watching it come together. 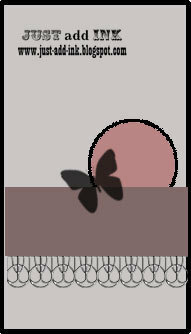 Pop over to JAI and see how the girls interpreted this weeks challenge and we would love to see how it inspires you. 1. Thank the blogger that gave it to you. 4.Present the award to 5 other bloggers-with 200 or less followers. 5. Lastly, let them know you have done so by leaving a comment on their blogs. Okay, so now to pass this on to some talented bloggers that have inspired me! Please take the time to get acquainted with these very inspirational girls and their blogs, if you haven't already. 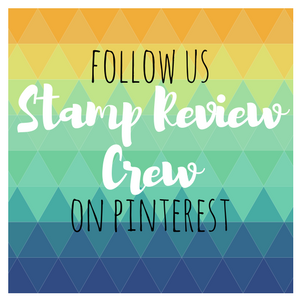 Here's my second project for Stampin Royalty, also another one marked off my must try list and using the same colour palette...Thanks girls for such an inspiring pic. This little Pop-Up card was so simple to put together and pretty cute if you ask me..:0) and l like it's CAS look too! I love that it still fit's in a standard envelope, but looks substantial when it's open, l will definately be making more of these. 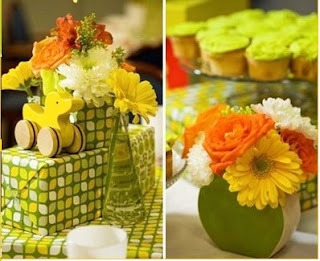 "Thanks for stopping by & Have a lovely Easter"
Can you believe I'm posting twice in a couple of days, definitely a rarity these days....I couldn't resist the gorgeous colours in the inspiration pic over at Stampin Royalty and had some play time today and just had to play along. As you can see l focused a little more on the orange, well Tangerine Tango to be precise and added in small amounts of Pear Pizazz and Daffodil Delight, here's a closer look at those. Did l mention how much l loved these colours?....Well so much so, that l kept right on playing and came up with a second entry for this Challenge, which l will be back to post shortly. 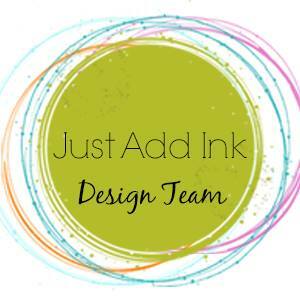 "HAPPY EASTER" everyone and welcome to a new Just Add Ink challenge.. I really enjoyed this colour combo and it was perfect for playing with my gorgeous new "Tea Shoppe" set from Stampin up, available in the current Autumn/Winter Mini. I stamped the large Teacup using Versamark and clear E/P onto Very Vanilla cardstock and heat embossed it, then used the emboss resist technique to apply the Pink Pirouette to the flower motif, it looks all shiny and china like IRL, but was hard to capture in a pic. 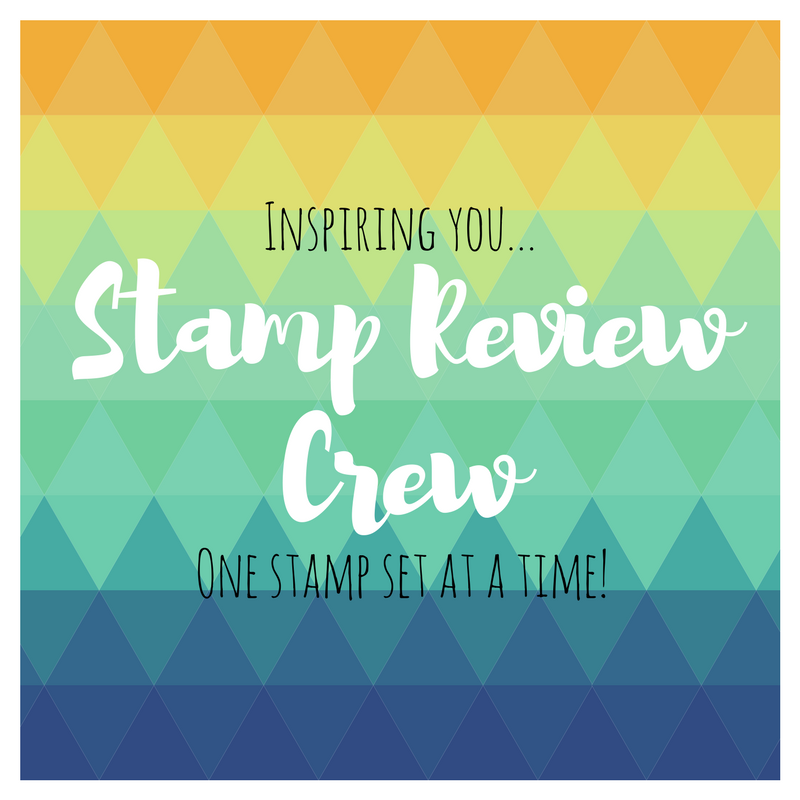 The Design Team have some lovely inspiration for you, so pop over and check them out, hopefully after the Easter festivities are over you can find the time to join us. "Thanks for stopping by & Keep safe"
Tea Shoppe & Tiny Tags stamps.